London, England, c1860, 6”T x 3”W x 3-1/2”D. 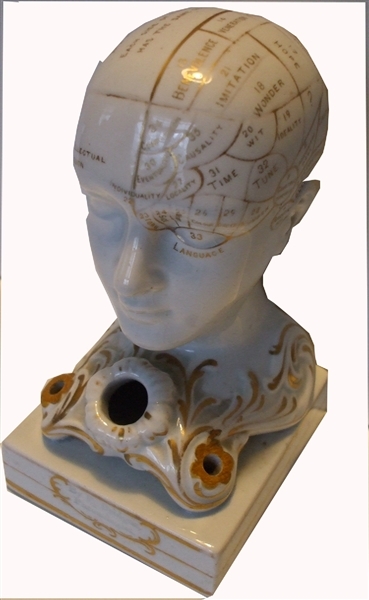 The gold print lines of the cranium divides areas representing the sentiments, with maker's title, “By F. Bridges, Preneologist” on the front. There are over 35 segments identified. 90% of the gold print remains. Fascinating item. Frederick Bridges was a renowned phrenologist and maker of the "phrenology heads" that have become iconic of the science today. He had such a gallery in Leeds. Phrenology (from greek: “knowledge”) is a theory which claims to be able to determine character, personality traits and criminality on the basis of the shape of the head by reading “bumps” and “fissures”.